Restaurants have fairly tight profit margins. How they price their menu items can have a large impact on its profits. This post will describe three ways to price your menu items profitably. A restaurant’s prime costs are its food, beverage, and labor costs. These costs are referred to as prime costs because, in the short term, they are the only costs a restaurant owner can manage. The Prime Cost method is based on the menu item’s cost and the desired food cost percentage of the restaurant. On average, restaurants have a 38% to 42% food cost margin—for example, a restaurant with $10 in sales will have a $3.80 to $4.20 food cost. Under the Prime Cost method, the food cost of the item is divided by the desired food cost percentage. Pomo D’oro Bros wants to price an entrée consisting of 4oz of chicken, a baked potato, green beans, and a salad. The total food cost of the items is $6. If Pomo D’oro Bros is aiming for a 40% food cost, it would divide the food cost of $6 by 0.4 and come up with a $15.00 menu price for the entrée. This method takes a restaurant’s projected labor, non-food expenses, and desired profit and divides the amount by the number of meals the restaurant estimates it will serve during a year. It then adds this amount to the cost of each food item. This method only works if a restaurant has menu items that are similar in cost, otherwise each menu item will have the same markup. The restaurant owner adds $3.67 to the cost of each menu item to determine the menu price. Again, this method works best when all menu items have a similar cost. Under this method, a hamburger with a cost of $2 with have a $5.67 price for a 35% food cost (good) and a steak with a cost of $6 will have a $9.67 price for a 62% food cost (not so good). This method is the same as the Prime Cost method above if the target food cost is 33%. If your menu items cost $4 and you multiply this by 3, you would get a $12 menu price. This is a 33% food cost ($4 cost divided by $12 price). The price you come up with must be compared with what your competitors are charging. If your competitor’s prices are slightly less than the amount you came up with, you may want to beat her price. If your competitor has substantial cost advantages like a low-cost lease you may not be able to beat her prices. In this case, you may want to stick with the higher price and focus on differentiating your restaurant from the competition. Internal controls are the procedures a business puts into place to ensure that assets are safeguarded, fraud is minimized, and procedures are actually followed. 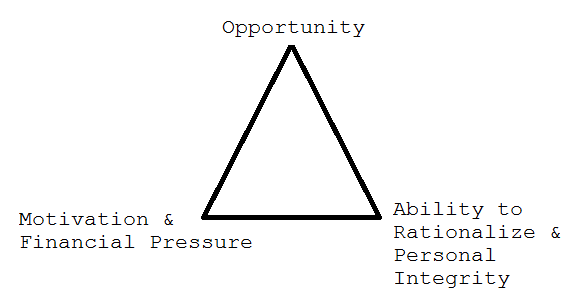 Any discussion of internal controls usually begins with the Fraud Triangle. An employee’s personal integrity is very important because many employees may have the motivation and opportunity to steal, but do not do so because of moral character. Once an employee is hired, an employer has little control over the employee’s motivation to steal or the employee’s personal integrity. The employer does have control over the employee’s opportunity to steal by implementing strong internal controls. An extensive discussion of internal controls covering all aspects of a restaurant’s operations can’t be done in a page and a half blog post, but I’ll include some examples of how an employee can steal cash and the internal controls that can implemented to help prevent these thefts. It is important to note that internal controls will never absolutely 100% prevent theft or fraud, but internal controls can substantially reduce the likelihood of such events. A problem restaurant owners run into frequently is trying to get their employees to report their tips. Employees hesitate to report the full amount of their tips because tips are subject to FICA and income taxes. Restaurant owners aren’t thrilled with tips either—the employer has to pay FICA and other payroll taxes on tips. All tipped employees who earn more than $20 per month (in other words, all tipped employees) are required to report their tips to their employers at least monthly. Practically speaking, restaurant owners cannot force employees to report all tip income. Some courts have held that the employer is only responsible for distributing IRS Form 4070 to tipped employees and instructing them to fill it out and return it. However, if the IRS performs a tip audit on the employer and finds unreported tips, the employer is responsible for the 7.65% employer portion of FICA. The employer will then have to amend federal and state payroll tax returns to report the additional tips. As a silver lining, the additional assessed FICA tax on tips qualifies for the Tip Tax Credit. The number of employees refers to all employees, not just tipped employees. More than 50% owners are not counted as employees. The number of employees is based on the average number of employees in two months—in the slowest month and in the busiest month of the year. Restaurants that operate in multiple locations must file a separate tip tax return for each location—even if the multiple locations operate within the same corporation or LLC. Even if there are 10 or fewer employees and the tip tax return is not required, employees must still report their tips. The form requests credit card sales, credit card tips, and total tips and total sales—based on this information the IRA can compare the tip percentage on credit sales and compare it to the tip percentage on cash sales. If credit card sales are tipped at 15% and cash sales are tipped at 3%, there is likely a problem. It is important to keep track of sales that are not tipped such as carryout sales, sales to employees, sales from nonfood items such as T-shirts or posters, sales for which a service charge was added, and customer walkouts. The law expired on December 31, 2011; however, as part of the Taxpayer Relief Act of 2012 passed at the beginning of 2013, the law has been reinstated for 2012 and is extended through 2013. What is Qualified Restaurant Property? if more than 50% of the building’s square footage is devoted to the preparation of, and seating for on-premises consumption of, prepared meals. Qualified restaurant property is the only category where Section 179 expense is allowed on the building itself, rather than solely on the improvements. Example: Tomato Brothers Restaurant buys a building for $300,000. Under old law, the building would be deducted over 39 years at $7,692.31 per year. Since a restaurant building is qualified restaurant property, it can be deducted over 15 years at $20,000 per year. This favorable provision also allows costs of leasehold improvements to be deducted over 15 years rather than over 39 years. Restaurant buildings and leasehold improvements also qualify for the increased $250,000 Section 179 deduction. A major drawback of the Section 179 deduction is that it is limited to the restaurant’s taxable income for the year. Any disallowed Section 179 expense is carried forward. A second drawback of this special provision is that the deduction cannot be carried forward after 2013. Any unused deduction is treated as placed into service on January 1, 2013 and is deducted over 15 years. Example: In 2012, Paradise Coney Island incurs $200,000 in qualified restaurant improvement expenses. Before taking in account the $200,000 Section 179 expense, Paradise Coney Island has $150,000 of taxable income. Paradise Coney Island’s allowable Section 179 expense is limited to its taxable income of $150,000. The remaining $50,000 of Section 179 expense is carried forward to the next year. If Paradise Coney Island has at least $50,000 of taxable income in 2013 it can deduct the remaining $50,000 in 2013. If Paradise Coney Island does not have income in 2013, the $50,000 unused loss is treated as placed in service on January 1, 2013 and is deducted over 15 years. If qualified restaurant property also meets the definition of qualified leasehold improvement property, it will qualify for 50% bonus depreciation. Since the building itself will not qualify as leasehold improvement property, only the improvements to a restaurant building (and not the building itself) may qualify as qualified leasehold improvement property. What is Qualified Leasehold Improvement Property? A lease between related persons (e.g., a lease between a taxpayer and his 80% owned business) does not qualify. 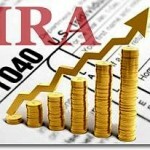 A special provision that originally expired in 2011 allowed IRA owners who are over age 70½ to take tax free IRA distributions if the distributions were transferred directly from the IRA to a charity. This provision has been retroactively reinstated for 2012 and is extended through 2013. The funds must be directly transferred to the charity—receiving a cash distribution and sending a check to a charity does NOT qualify. The maximum amount that can be transferred is $100,000. This provision effectively allows an above-the-line deduction for charitable contributions when made out of an IRA. Thus, taxpayers don’t need to itemize to claim a charitable deduction. Additionally, the 50% AGI limit on most cash contributions will not apply. Finally, since it is an above the line deduction, AGI is not increased by the IRA distribution so the distribution does not subject taxpayers to income phaseouts of deductions and credits. Example: Jim is over 70½ and does not itemize. He takes a $5,000 distribution from his IRA in cash. He then writes a $5,000 check to a charity. He claims the $5,000 distribution in income. He does not benefit from the charitable contribution because he does not itemize. However, if Jim had the IRA trustee directly transfer $5,000 to a charity, Jim’s $5,000 distribution would be tax-free. He essentially has an above-the-line deduction for the charitable contribution. Food costs of a restaurant tend to be around 40% of revenues. It is one of the largest expenses a restaurant incurs, and it is therefore critically important that a restaurant effectively manages its inventory. The par level of inventory is the amount of inventory needed to meet customer demand and provide a cushion in case of an unexpected spike in demand or a delay in delivery. This cushion is referred to as safety stock. Inventories must be divided into high-turnover inventory and low-turnover inventory. High-turnover inventory such as meat, seafood, and produce, must be ordered frequently to maintain freshness. Low-turnover inventory includes spices and dry goods. Low-turnover inventory tends to be less expensive and isn’t as critical as high-turnover inventory. As a general rule, the higher the turnover, the higher the safety stock requirement. Generally, the safety stock should be around 20% to 30% of the weekly inventory use. You must also be guided by your experience—the formula is an estimate of the par level inventory. The regular counting of inventory sends a clear message to employees that inventories are being closely monitored. This can help reduce theft as well as reduce over-portioning. It will also help the restaurant owner properly rotate inventory so older inventories are used first. Generally, it is best to count food and supplies monthly and to count liquor weekly. A neat and orderly storage area adds greatly to the efficiency of an inventory count. Items should be maintained in the same location and similar items should be located near each other. When a carton has been opened, the contents should be removed and stacked. This makes it easier to count the open items. Items should be listed on the sheets in the same general order that they are located in the storage room. Preprinted count sheets may point out inventory that should be in the storage room, but for some reason is out of stock. It may also point out inventory in the storage room that was never officially ordered.